Gravitas has debuted the trailer for an indie titled Amanda & Jack Go Glamping, which is playing at the Austin Film Festival this month. For those who don't know, the word "glamping" is an amalgamation of "glamorous camping", essentially describing luxurious camping in which you go stay in fancy places - in this case, a "yurt". 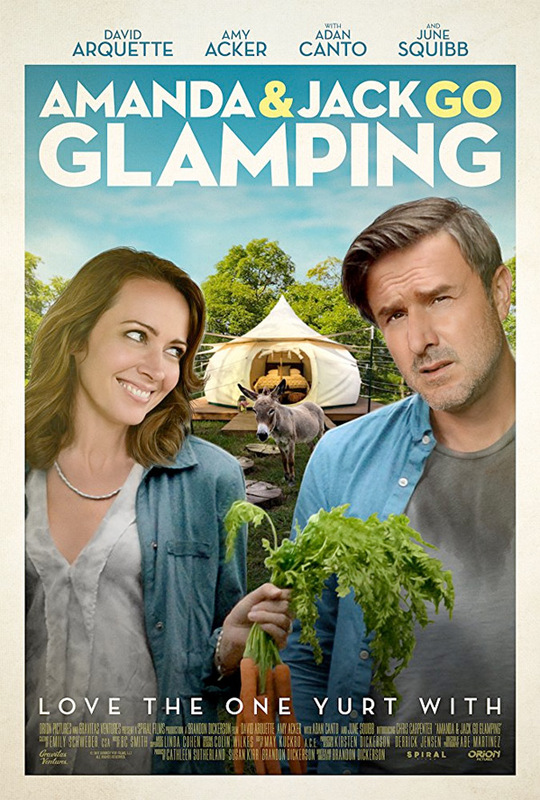 David Arquette and Amy Acker stars as a married couple who decided to go "glamping" in hopes of reigniting their spark for each other. Of course, things get weird and crazy, and yeah you know how these films go. This also stars Adan Canto, Nicole Elliott, Daniel Ross Owens, Chris Carpenter, Gustavo Gomez, and June Squibb. It's not really my kind of indie comedy, but it might be up your alley. With their marriage on the rocks, Jack (Arquette) and Amanda (Acker) go "glamping" to reignite their spark. With the arrival of honeymooners and a hunky landowner, Jack must dive into an exploration of love, failure… and donkeys. Amanda & Jack Go Glamping is written and directed by American filmmaker Brandon Dickerson, of the films Victor and Sironia previously, as well as the doc A Single Frame. This will premiere at the Austin Film Festival coming up later this month. Gravitas Ventures will then release Amanda & Jack Go Glamping in select theaters + on VOD starting November 10th next month. Anyone?